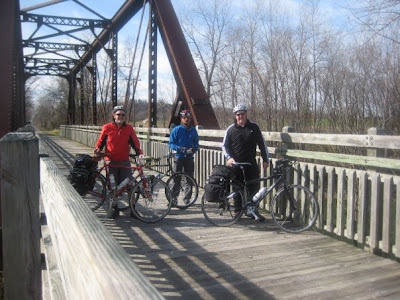 In This Body: Guest Post: N., "Riding the Katy"
Guest Post: N., "Riding the Katy"
An extraordinary number of planning sessions preceded N.'s 2-day tour on the Katy trail. Whatever; who needs an excuse to hang out in a bike shop? N., thanks for the post — as ever through the years, I salute your cycling fortitude and your planning prowess. In a desperate attempt to hang on to cycling weather, the Groody Brothers* (aka Mark and David Rainey) and I headed out to ride a large section of the Katy Trail on November 12th and 13th. The plan was to take the Amtrak to Hermann, MO and ride west to Sedalia. Mark and I boarded the train in KCMO and David joined us in Sedalia where he had parked his truck for the journey back. I rode my Trek 820 cro-moly beast that has served me well for 17 years. I loaded it with panniers and a rack bag and thought I’d overpacked until I saw Mark and David roll up on their steeds. David was on a Trek 7.5FX and Mark rode his trusty Surly Long Haul Trucker. Panniers and bags fully loaded, they looked ready to challenge Lewis and Clark’s record for hauling crap west. It was my first trip on an Amtrak train and it proved to be all that Amtrak promised (on-time departure, no-frills travel). 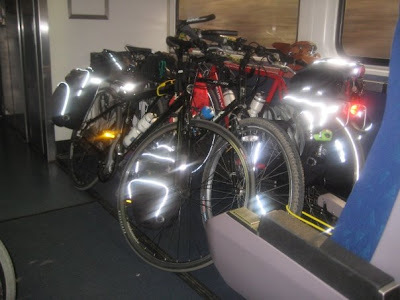 Our bikes were stacked in the bulkhead of the railcar, but we were surprised that Amtrak provides no way to secure your bike against the rolling (roiling?) of the train. Note to future travelers — plan to carry a few bungee cords to secure your bikes on the train. The snack car attendant, upon learning of our plans to brave the vast wilderness of the Katy, asked if we were carrying a steel pipe to fight off the coyotes and bobcats that he imagined torment cyclists on the trail. I assured him that I’d be fine since I didn’t need to outrun the bobcats, I just needed to outrun David. We arrived in Hermann at noon and after a quick lunch and a hearty “Let’s Ride! !” from David, the Three Amigos headed west on the Katy. Our average speed hovered around 13 miles per hour and we stopped often to smell the roses, uh, farmland. We even took time to visit downtown Mokane (Pop. 188) which consisted of a Lions Club sign, an old town jail, and a honky-tonk bar. I offered to liven up things in town by going into the bar and asking “hey, where all the white women at?” The Groody Brothers, who clearly have no sense of adventure, promptly vetoed the idea and distanced themselves from me. I swore I heard the banjos from Deliverance playing as we left town. We made a quick stop in Tebbets to visit a cyclists’ hostel managed by the Conservation Federation of Missouri. If you are looking for a cheap, no-frills crash pad, you’ve found it. The place offers bunk style beds, laundry facilities, a bike repair room, and a grill for $7.50 a night. The key to the place hangs on a nail on a light pole. Welcome to small town America! 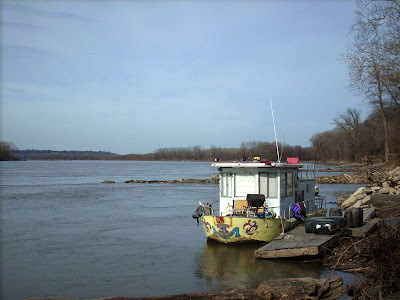 Unfortunately, we had a date with big city traffic so we moseyed along to Jefferson City. David had the foresight to book us into a Motel 8 in Jefferson City, so we made tracks towards the giant dome. Not realizing that the east side of the bridge has a bike lane, we foolishly braved traffic on the west side, riding on a one-foot shoulder. It is a miracle that a) we didn’t get pulled over for being dumb-asses and b) we didn’t get honked at by drivers doing 60 miles an hour about 3 feet from us. Once we got past the bridge we were delighted to find that we had a mile-long climb to get to our hotel. Guess who took KOM points? Yeah, that’s right — the skinny guy won. After 52 miles of riding, dodging traffic, and climbing a hill, we weren’t in any mood to tear it up in Jeff City so we made a dinner of Domino’s pizza and Coronas. Since we were budget-conscious (aka cheap skates), we were sharing a room. The hotel was kind enough to let us store our bikes in an adjacent room, so our bikes got a better night’s sleep than we did. Day one was a resounding success, especially since none of us had been eaten by coyotes or bobcats. 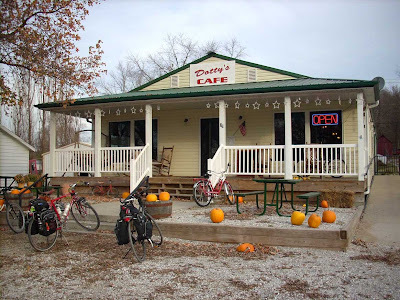 An hour’s ride brought us to Hartsburg, which is trying to market itself as a destination for cyclists. A tiny winery and a remodeled railcar vie for quaintness points. 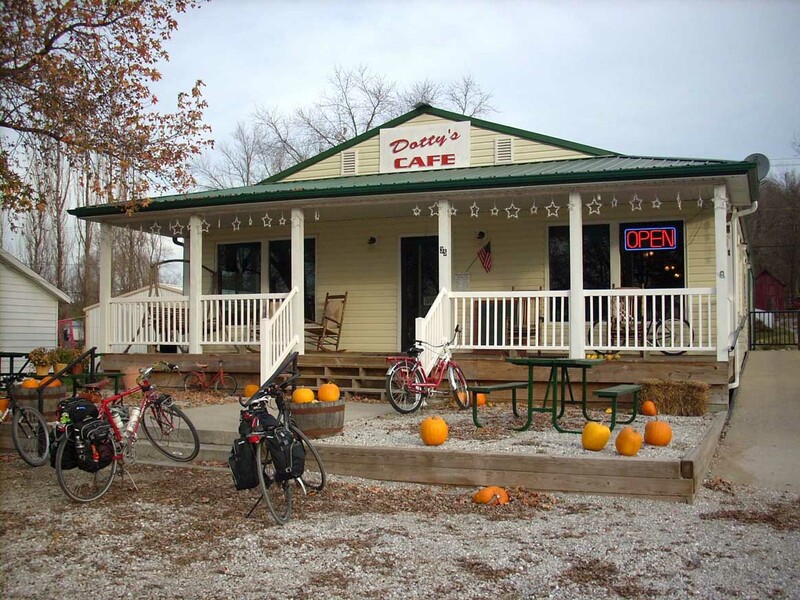 We stopped for a real breakfast at Dotty’s, which is run by... Dotty! For once, truth in advertising! Dotty is a huge fan of Elvis. Clues of her affection include a plethora of Elvis posters and pictures and a satellite TV tuned to the Elvis music channel. The Groody Brothers were gravely disappointed in Rocheport because the local bike shop had closed for the winter. They G Bros live to visit bike shops the way Whitney Houston lives to visit crack houses. Onwards we rode towards Booneville, after spitting in Rocheport’s general direction. The only thing picturesque about this leg of the journey was the tunnel just west of Rocheport. As we approached Booneville we had a strange dude appear out of nowhere and latch on to our caravan. He hung on to David’s rear wheel with a Brokeback Mountain-like devotion. He volunteered to ride with us to Booneville and faithfully followed David into town despite riding a creaking Huffy. After a leisurely lunch in Booneville, we set off for the second half of the day’s journey. The G Bros have each ridden this section of the trail going east and seemed to recall that we’d have an extended downhill ride heading west out of Booneville. Clearly they had both partaken of the local moonshine on their previous rides because unless a steady climb can be called downhill, we never caught a break. With 40 miles still to go and daylight starting to fade, we hustled along the steady uphill ride. Who knew that a 1% grade on crushed gravel could cause so much pain? As the landscape slowly faded to black, I drew my imaginary steel pipe and kept a sharp eye out for coyotes and bobcats. My Amtrak friend had forewarned me, and I didn’t want to disappoint him. We finally rolled into Sedalia after 12 hours on the road, thankful that David’s truck would transport us back home. A good time was had by all. 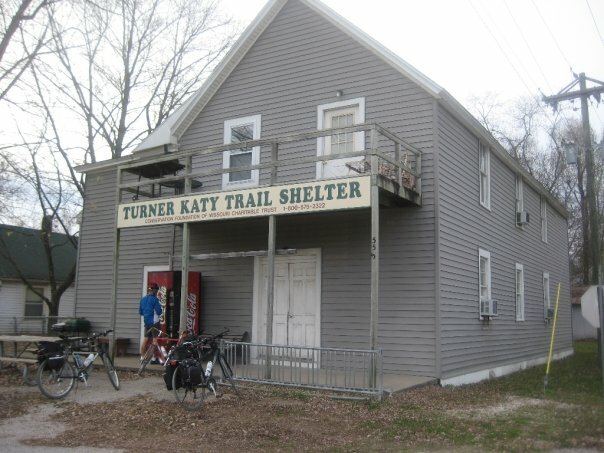 I can’t wait to do it again when riders can get on the trail from the outskirts of Kansas City. Late Spring and early Fall are the best times to ride the trail. The days are long enough, and the weather is just right. Riding toward St. Louis puts the prevailing winds to your back. The terrain is gently downhill going east. If you plan to ride by Amtrak to the trailhead, book tickets in advance. Bicycle transport on trains is limited to four bicycles. Plan to carry bungee cords to secure your bike on the train. Steel pipes are optional. The crushed gravel trail throws off a fine powdered dust. If you love your bike, carry chain lube to clean your drivetrain every night. If you don’t love your bike, I spit in your general direction. Carrying camping gear greatly increases your options for overnight stops. 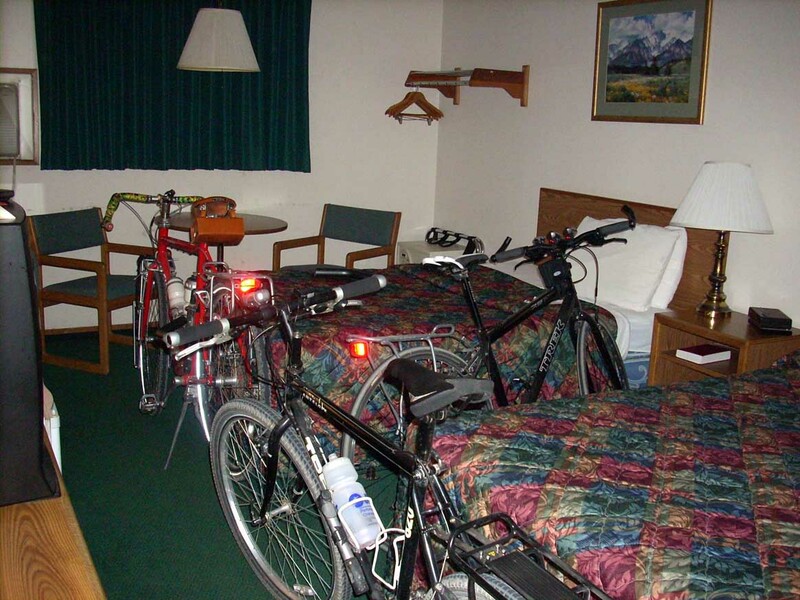 Lodging options are limited on the trail. The Katy trail website is a pretty good planning resource. *"Groody" is pronounced "Grody." N. did not recap the long discussion he says he had with the Groody Bros. on this point, except to say that "it's like the Moog synthesizer." Go check out the Groody Brothers Bicycle Restoration Project page on Facebook.